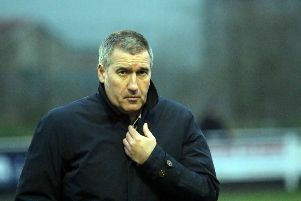 Banbury United boss Mike Ford knew all that was missing was a goal after seeing his side hold high-flying Stourbridge in Tuesday’s Evo-Stik League South clash. The Puritans had the better chances in the premier division central clash, even though Aaron Hayden missed a sitter for the Glassboys, but had to settle for a point. Ford said: “It was a good point but it could have been more, the players are very disappointed that they didn’t win the game. I thought we deserved to win it, we had a lot of chances, three in quick succession. “Stourbridge were a monster of a team, they were second before the game and have now gone top but we matched them. To produce that level of performance, create that many chances and be disappointed not to have the game shows how much more confident we are now.